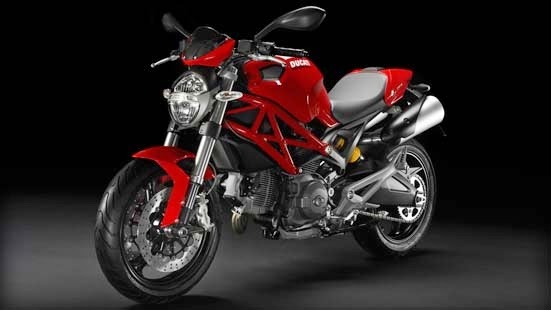 2014 Ducati Monster 696 Featrues and Specs - When you choose to ride the Monster, you are not just choosing a bike, but an entire lifestyle. A desire to experience the exhilaration of naked power from an iconic motorcycle. An immensely strong but light tubular steel Trellis frame with aluminium rear sub-frame is the visual and structural backbone of the 696 and 796 Monsters. 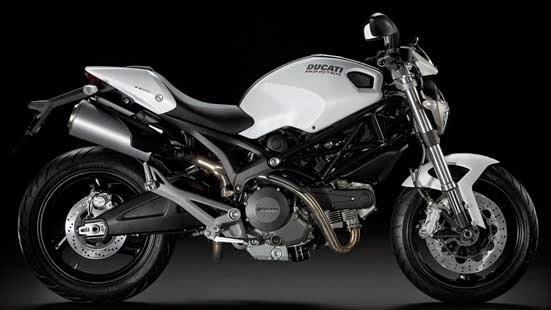 Delivering rigidity with minimal mass, the frame design is pure Ducati in its ingenuity and simplicity and enables a useful 64 degrees of lock-to-lock steering travel. The lightweight aluminium sub-frame maintains visual continuity with the footrest hangers and swingarm, and is designed to accept a passenger-friendly grab-rail kit available as an accessory from Ducati Performance. The kit further enhances passenger ride comfort without compromising the Monster’s stylish lines. Looking clean and minimalist in true Monster style, the brightly illuminated display provides all essential data by default, and even more by scrolling with the left-hand switchgear. Data includes speed, revs, time, scheduled maintenance, oil temperature, ABS status and battery voltage, while warning lights illuminate for oil pressure, fuel reserve, turn indicators, high beam and neutral selection. In addition, the instrumentation presents a reserve fuel trip, immobiliser status and automatic light-off function after 60 seconds with the key on as well as a memory to store lap times recorded by using the high-beam flash button as a stopwatch. The engine of the Monster 696 is the legendary Desmodue, 696cc, air cooled, L-Twin engine whose 80hp gives it that unmistakable Ducati sound. Developed for an incredibly flexible power delivery, the 696 Desmodromic engine provides enough torque to exit the most challenging of corners. The impressive torque, typical of the Ducati L-Twin engines, will excite with every twist of the throttle. 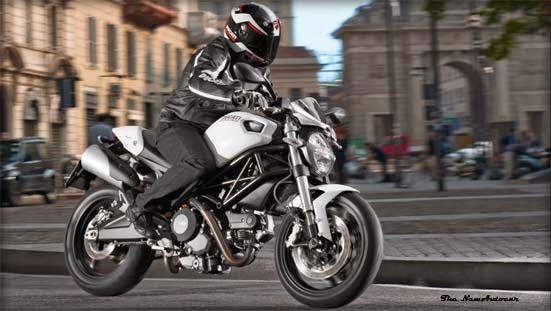 The Monster 696 produces 80hp (58,8kW) @ 9,000rpm and 50,6lb-ft (7,0kgm) of torque @ 7,750rpm. Providing a deep and rich exhaust tone within current noise and emissions regulations is no mean feat, but the Monster 696 definitely provides the L-Twin sound famous of Ducati. Its bold, high-level twin mufflers also make a striking style statement. The exhaust system on the 696 has one Lambda probe dedicated to each cylinder, enabling precise fuelling for a smoother power delivery as well as complying with current emission regulations. In 1992 Ducati unveiled a new prototype that was to become an icon. Ducati’s creation awed the crowds and the world’s media of that year’s Cologne International Motorcycle show. The 900 Monster was a motorcycle that created a truly new niche - dramatically styled, minimalist in stature yet bristling with innovative engineering solutions. The Monster’s radical styling has also provided the inspiration for an entire after-market sector specialising in hot-rod parts for this legendary machine. For this reason, rarely do you see two Monsters the same. This radical and refreshing design departure also influenced other manufacturers but, as the old adage states: imitation is the highest form of flattery... The Monster is characterised by a long and successful history, by its introduction during the years of numerous cylinders and uncountable colour options, but above all by a constant technological evolution that this year brings us to the birth of the last version: the Monster 1100EVO, "The Ultimate Monster". Whether you’re a motorcyclist, a would-be motorcyclist or a passenger, whether Monster has been your travelling companion on a thousand adventures or whether it’s a dream that’s still to come true, whether it’s parked in your garage or is just an image firmly stamped in your mind. The riding position of the Monster 696 has been specifically designed to put you firmly in control. The seat height is only 770mm (30.3in), making it easier for get both feet firmly planted on the ground. The GP-style swingarm is chill-cast using aluminium in its most noble form. Gravity cast and heat treated, the component achieves the best mechanical characteristics as well as reduced final weight for improved handling. The heavily tapered and deeply sculpted fuel tank cover allows maximum comfort and control. The narrowing of the bike’s ‘waist’ has the same effect as lowering the seat height, making it easier for more riders to get both feet flat on the floor. The steering-lock is vastly improved with a useful 64 degrees of lock-to-lock steering travel. Incredible attention to detail has gone into maximising the effective steering-lock. The latest in Brembo braking hardware delivers exceptional braking power front and rear to improve rider safety. At the front, 320mm floating discs are gripped by four-piston, radially mounted callipers, while a 245mm floating rear disc works in combination with a twin-piston calliper. This powerful braking set-up offers unrivalled feel and feedback making the 696 safer across a broader spectrum of riding abilities. Lightweight 3-spoke aluminium alloy wheels increase agility and reduce rider effort. The 3.50x17 front wheel wears a 120/60ZR tyre while the 4.50x17 rear wheel runs 160/60ZR rubber. By resisting the temptation to over-tyre the 696 for styling’s sake, the end result is light, predictable and confidence inspiring steering qualities at a wide range of speeds with truly outstanding stability. At the rear, a Sachs monoshock unit with progressive linkage provide a wide spectrum of both spring and damping settings. Visually simple digital instrumentation provides an array of data on command or, at a glance, just speed and revs. Information available at your fingertip include: scheduled maintenance warning, oil temperature, trip odometer, lap time, fuel reserve, warning light for low oil pressure, turn signals, over-rev warning, immobilizer and neutral warning light. An LED rear light unit satisfies the minimalist, weight-saving design ethos found throughout the Monster 696. The specially designed strip of LED are enhanced by a special diffuser lens to deliver outstanding light clarity and incredible longevity. For the Monster 1100EVO, even the license plate light uses LED technology. The new user-friendly brake and clutch with 4-point adjustable levers provide easy-to-reach control for all hand sizes. The new silencer guards feature a longer shape and provide improved heat protection. The 696+ is a factory-personalised model featuring some neat designer touches to help you stand out from the crowd. A beautiful single seat cover creates the clean look of a racing seat. The cover easily unclips to allow room for your favourite passenger while the neat micro-bikini fairing adds a custom touch to the front end. 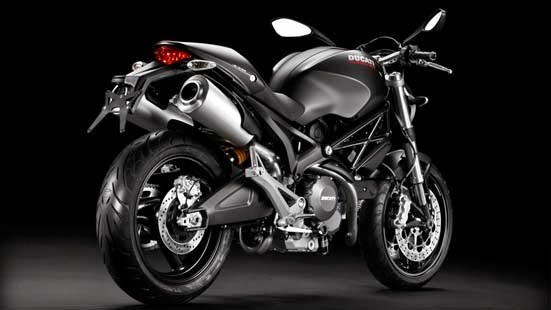 For the first time since its debut, the Ducati Monster is available with ABS (anti-lock braking system). The Monster 696 ABS is equipped with ABS, the single seat cover and the neat micro-bikini fairing.